One of the most burdensome tasks of the testing manager is to follow up on the progress of the testing project. One way to do it is to look at the status of your tests in terms of pass and fail which is OK but it does not really reflect the RISK involved with this measure. When you are looking only at the PASS/FAIL measure without looking at the same time at the progress of your baseline is really like running in the dark. You feel the effort but you really do not know the distance you have passed. From the baseline measure, you can tell by the gap in build numbers how far your first tests from your last test in terms of baseline. Say you started your tests in x.y.z.55 and you ended your cycle at Scene 5, so you know it took you 45 builds to complete a full cycle. Then you need to ask what happen in those 45 builds, what was the nature of the changes during that time, where new features introduced, where any critical defects left during that period and many other interesting questions that can help you take the right decision about your GA release. 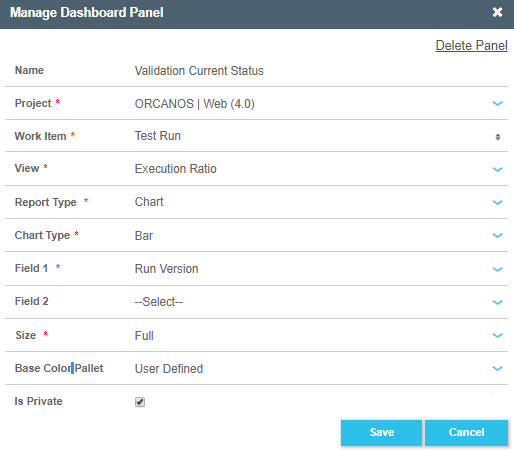 So we have decided to share that with you and show you how to build such a report in Orcanos. You can follow the below guide lines. Click on Add panel option. Project: Select the Project name for which user wants to create the report of testing. Workitem: Select workitem Test Run. It will display the Test Run report to the users of the Test Cases. Report Type: Select the report Type as chart, as we are creating chart to know the report. Chart Type: Select the report type as per your requirement. Is Private: Check if you want to make it private and uncheck if you want to make it public. It will display whole report on the baseline version level.